From jut above Horseshoe Park along Old Fall River road is an overlook famillar to many who make this famous drive in Rocky Mountain National Park. This vantage point gives a commanding view of Horseshoe Park and Deer Mountain. During the winter and spring months, Old Fall River is closed which allows hikers the ability to enjoy this location in total solitude. 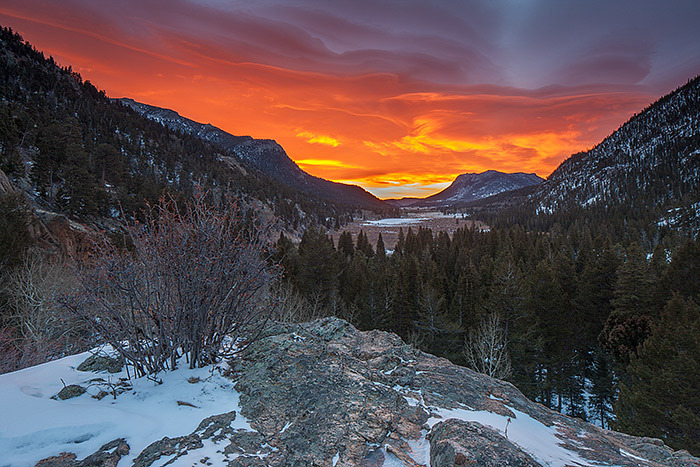 A lenticular cloud hangs over Estes Park and the eastern foothills and brings brilliant color to the sky over Rocky Mountain National Park. Photo © copyright by Thomas Mangan.